The third annual New Richmond CountryFest will return to Duthie's Point Festival Park in 2018 with new dates and plenty of country music, camping and games and activities for everyone. The festival will take place from June 30 through July 8. The change of dates will allow early birds to take in Canada Day activities which will take place on the site on June 30 and July 1. Sylvie & Marco will host amateur shows on Canada Day (July 1) and on Sunday July 8 from 2 to 5 PM. If you're interested in showing off your talent, contact Mike Geraghty at (418) 391-6097 or Sylvie Normandeau at (418) 391-4559. 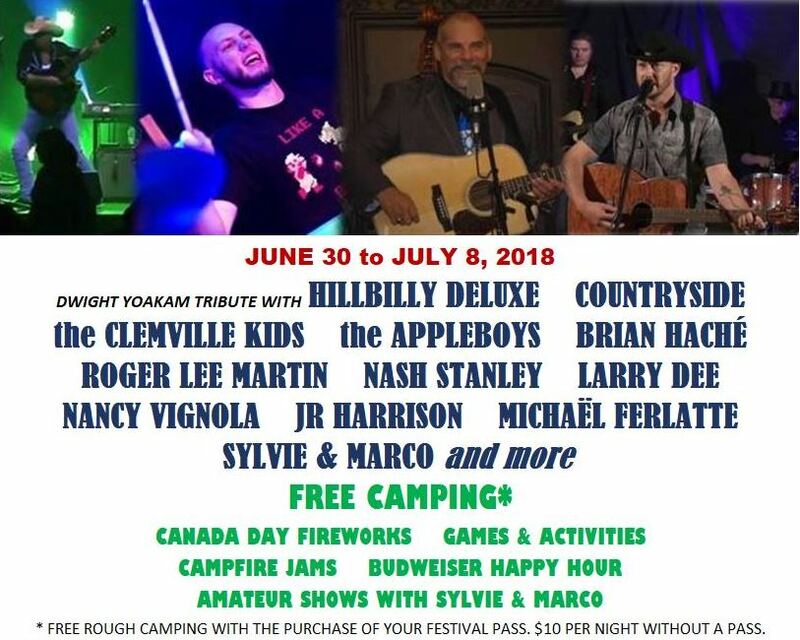 Country music fans who arrive early will be able to take in all the activities surrounding Canada Day at Duthie's Point. Those include games and activities for everyone, an amateur show with Sylvie & Marco, a BBQ supper and birthday cake, the Clemville Kids on stage and of course, fireworks. Rough camping is FREE with the purchase of your CountryFest pass and just $10 per night without a pass.